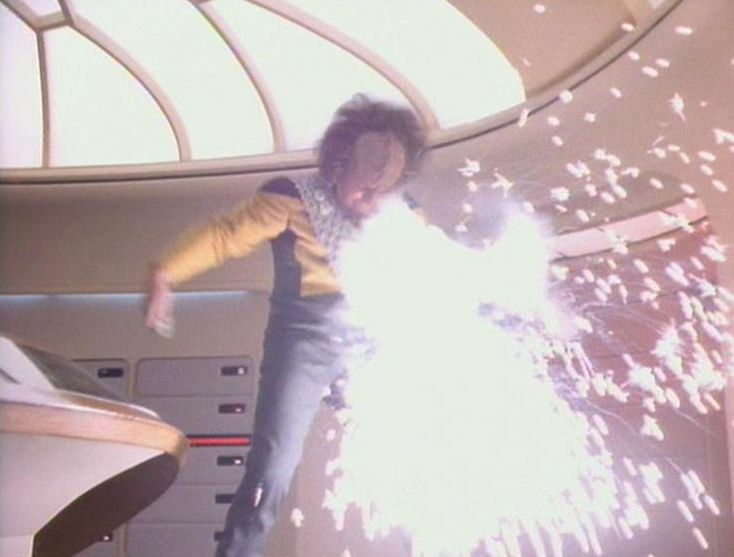 Data has learned of new cybernetic techniques that will allow him to replicate his own Posotronic Brain in a new android life form. He does so, bringing his daughter Lal into existence. Unfortunately (for all of us), Starfleet has a different idea that Data as to what sort of treatment would serve Lal's best interests, and acts to remove her to a research facility. This conflict between a father and his government may spell the end of careers, and perhaps even lives. Men want to be him. Women want to be with him. Androgynes want to go female for him. Even machines want to canoodle with him. His name is Riker. William T. Riker. The Enterprise encounters an odd space anomaly. While investigating, a ship emerges. It appears to be the Enterprise-C, a predecessor to our Enterprise...or so reports Lt. Yar, suddenly standing on the bridge of the Enterprise-D. Somehow, history has been changed. Yar never died on Vagra II and the war with the Klingons never ended. The only person onboard who seems to sense the change is Guinan, who must now convince Picard that the Enterprise-C is somehow connected to the changed timeline and convince Picard to set things right. 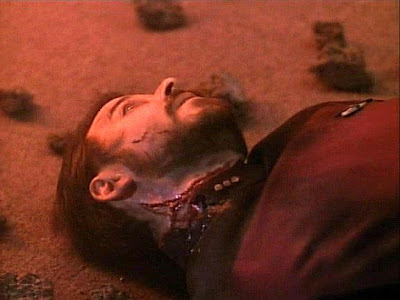 Sorry, Wesley-haters... this is the only main cast death you'll get. On a mission to check on the progress of a new Krieger Wave converter, Commander Riker runs afoul of the lead scientist on the project, Dr. Nel Apgar. 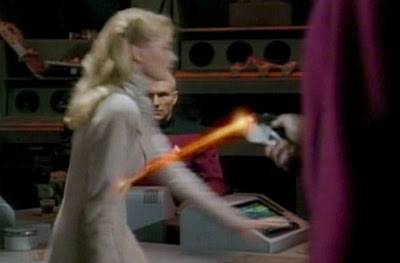 Things get really dicey, though, when the research station explodes, killing Dr. Apgar and casting suspicion on Riker for murder. Complicating matters are the conflicting testimonies of the survivors. 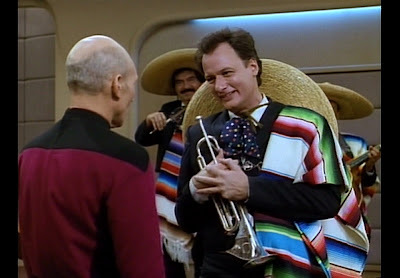 Now, Captain Picard must make a ruling on whether Riker is to be extradited to the planet and possibly subjected to harsh alien justice. We hope, when all is said and done, that this is not Star Trek's most enduring contribution to the Internet. Kelly and Matthew are proud to announce that a little Treklet is on the way. The 20-week ultrasound showed a healthy, bouncing baby, and we're sure the kid will soon grow to love Star Trek as much as we do. We'd love any advice anyone has on raising well-rounded geeks! While delivering medical supplies to the world of Rutia, the Enterprise becomes embroiled in a struggle between a separatist faction on the world and its dominant government. Doctor Crusher is abducted by the terrorist leader, Kyril Finn, and becomes a pawn in his high-stakes game of violent political expression. 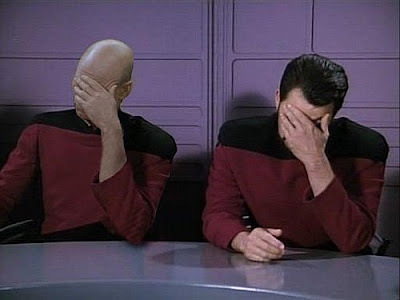 What will the cost to the Enterprise be for occupying the wrong place at the wrong time? The Enterprise is in orbit of Angosia, a recent applicant for Federation membership. During a tour of the planet, a dangerous criminal escapes an orbiting prison facility. The Angosians are not equipped to handle this crisis and ask the Enterprise for help. After the prisoner gives a surprisingly resourceful chase to the Enterprise, they manage to capture the prisoner, one Roga Danar. While awaiting an Angosian ship to take Danar back, Counselor Troi speaks to Danar in the brig, and discovers he is the not by nature the violent man the Angosians suggest he is. Danar was part of a group of physiochemically altered super-soldiers created by the Angosians to suit their needs during a war. Now the Enterprise must contend with a highly skilled solider bent on escape at any cost. Well, we've finally got a new, improved brig. Let's see how well it works! 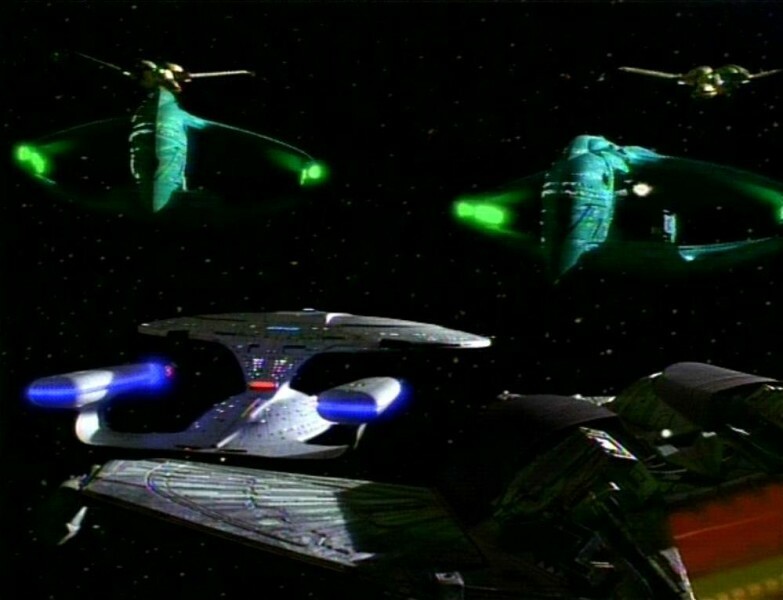 A mysterious Romulan defector fights his way to the Enterprise through a gauntlet of Romulan warbirds. Although he claims to be a lowly military functionary, he also claims to have detailed knowledge of a Romulan plan to begin a major new offensive against the Federation. 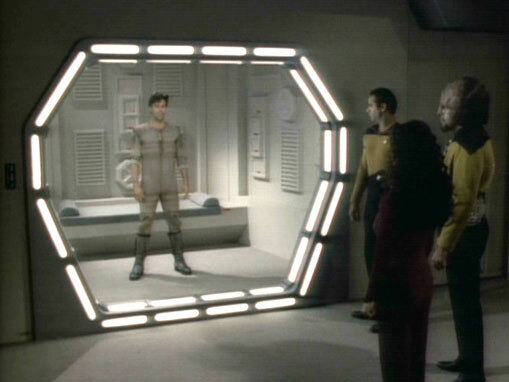 But as the crew of the Enterprise investigates his claims, things start failing to add up. Who is the defector, and is his story a fabrication? A devastating war between two great powers hangs upon the answers. 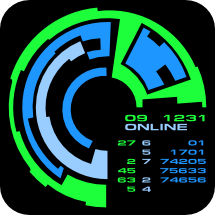 The Enterprise is responding to distress call from a Federation outpost. They find a group of nomadic thieves who call themselves "The Gatherers" are responsible. They are a splinter group from a planet called Acamar. The schism that separated them is a century old, but given increasingly bold incursions into Federation space, it falls to the Enterprise to try to mend the rift. A young member of the Acamarian leader's staff, Yuta, catches Riker's eye.Complicating matters, a Gatherer is mysteriously killed during the negotiations. While Picard brokers a delicate peace, Riker must investigate the death. Who is responsible and is Yuta somehow involved?